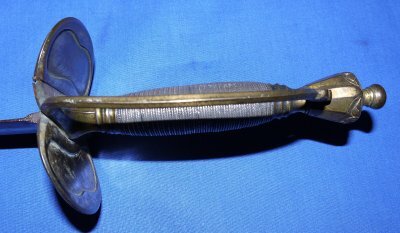 A well above average condition 1796 Pattern British Infantry Officers Blue & Gilt Etched Sword. Original officer's name "I Todd" to folding guard. The blade has the 1801 to 1816 British Royal Coat of Arms, so Napoleonic. Also etched "Wood" (the cutler's name) and "Warranted" to the blue and gilt blade; approximately 60% remaining. The folding guard name inscription actually reads "I Todd" and then underneath "S V", which is most likely an abbreviation for the regiment he served in, so diligent research may well identify him fully. The 31 inch blade is in good condition, some patina / light rush pitting towards the tip end, age and wear generally, the etching still quite good; the etching around the ricasso with rust staining. Blade firm in the hilt. 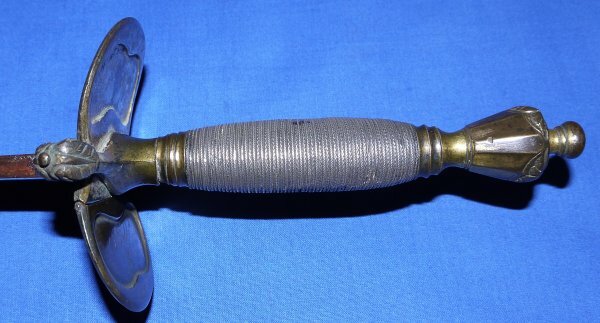 The hilt with some gilt remaining. The folding guard section works well. The silver metal wire grip mostly good (some small loses). 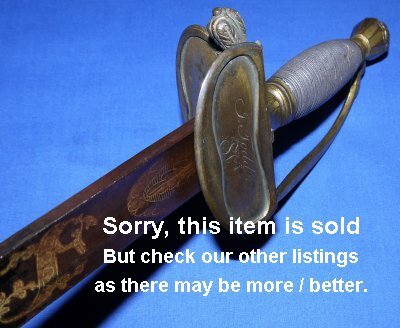 A lovely blue and gilt etched sword with the potential for research. A great buy at £? (too late, now sold). Please quote item reference AB71 (0131). Further / full sized images available upon request.